We spent two great months on our vacation in Puerto Vallarta and enjoyed almost every minute of it. My wife and I consider ourselves to be pretty adventurous . We were willing to try many things, although we did not stay out at the bars very late We always were careful about our surroundings and the people around us. That is the only thing that we would caution anyone planning to go to PV. Just like any other city that you visit as a tourist, always be aware of your surroundings. Try to not look like a tourist and dress down to avoid attracting attention. Give the impression that you know where you are going even if you do not. They have an excellent although antiquated bus system. The buses go almost everywhere within PV as well as to many of the other villages that are on the bay and a few miles from Puerto Vallarta. They do not cost much and only take cash, so always be prepared with cash to pay the driver. The buses are antiquated in that they have metal seats, they shake, they rattle and they are uncomfortable, but they are running from early in the morning until about 10pm at night. After 10pm, you need to be prepared to take a taxi wherever you are going. They have several Starbucks coffee shops in town so if you want a good cup of coffee then this is the place to go. We know it is not Mexican, but sometimes you just need to have a good cup of coffee that you can trust. There are many restaurants that cater to every price as well as every type of food. We tried a lot of Spanish restaurants and really enjoyed them all. Some will automatically place a bottle of tequila on your table that is included with your meal. There may only be four or five shots in it, but that is just fine. At one restaurant we ordered beer and were served tequila chasers with it. Many restaurants will sell a beer for a dollar which is very inexpensive by Canadian and US standards. There are lots of excursions to go on. From trips out on the ocean to go fishing and do some whale watching to zip lining in the jungle they have it all. We went zip lining which included donkey riding and a trip to a tequila factory after the trip was over. A great way to spend the day. Book with a reputable firm and you will be safe as well as enjoy yourself. 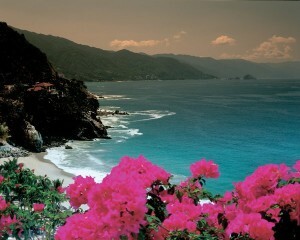 We lived in the marina area of Puerto Vallarta and enjoy the location very much. Far enough from downtown to be quiet, close enough by bus to be comfortable and close to the actual marina to enjoy the bars and a few restaurants. We stayed at the Portofino in the marina which is a private condo with a large pool area and a beach right in front. Very safe as far as we could tell and a great place to stay. Just make sure that the unit you book is clean. Some are not very clean and will need a thorough cleaning when you move in.